Hi Miss Terri, Thanks for the lovely comments and visit. I just adore your love for your family and hubby....and those cookies look so YUMMY! You know I am a fan of your work and I can't wait to see what else you come up with. You know I have been trying to join Paper Whimsey, but I cannot get in. Are they full? Also, your cards are beautiful! Your family is going to love them! BTW, I love your fairy slippers, is there a template? If so, is it available for sale? What a beautiful post (and tree)! :) It made me feel the Christmas spirit which I lack this year. 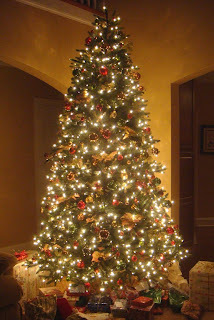 Your tree is beautiful and I love your Christmas decorating on your blog. You are a blessing to me. You inspire me. You make me feel good. I am so happy you are so blessed with the spirit. Hugs and xoxos and have a very very merry merry Christmas, my friend. This is such a sweet post, I'm so happy that you shared your "thankful" thoughts with all of us. Merry Christmas to you and to all....a good night! Thank you for sharing your lovely tree and your sweet sentiments. You are so special. Enjoy your holidays and enjoy your new studio. And may I say that I am thankful for knowing YOU. Isn't it wonderous to know that we met on the net, shared lovely art, and are friends. You are a dear soul...and I wish you the best in 2010!